Tonight we were invited along for a sneaky peek of The Fat Hippo Underground. 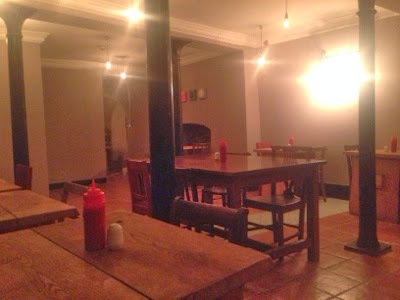 We love, love, love The Fat Hippo in Jesmond and could not to wait to see what this new venture would have to offer. 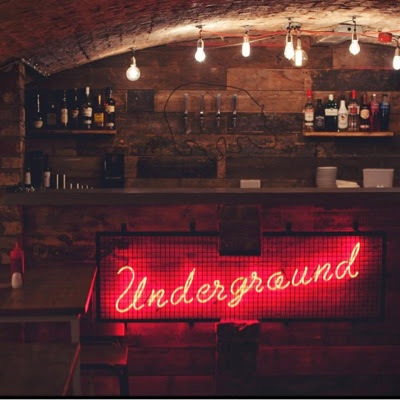 The Fat Hippo Underground is situated in a prime location in the centre of Newcastle - just next to the Theatre royal on Shakespeare Street. Blink and you may walk past it though as it is just a small doorway leading you underground. Keep your eyes peeled for the illuminated red fat hippo above the door and you should find it! Image courtesy of The Fat Hippo's facebook page. The interior feels very rough around the edges (which I think is intentional) and rustic in style. You would not feel out of place dressed up to the nines before a night out, in your tracksuit bottoms and trainers or in a smart suit straight from work - it has the sort of cool vibe where anything goes. 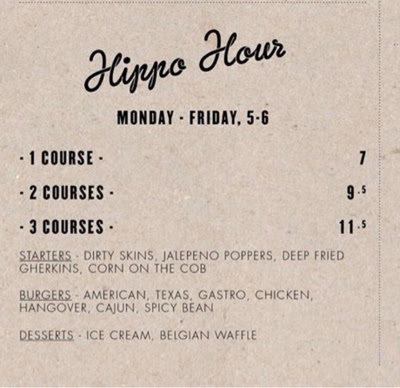 As with the original fat hippo, I adored the playlist in the background. Who wouldn't want to smile when Planet Funks's Chase the Sun is being played. Whoever is in charge of music here has it just right! 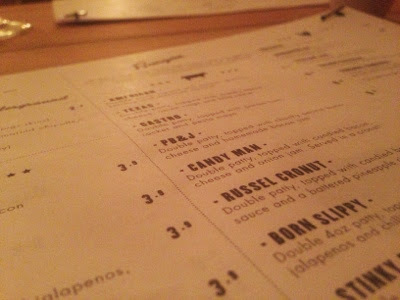 We browsed the menu which is unusually made of unlaminated paper - not sure how long these will last before they need replacing? 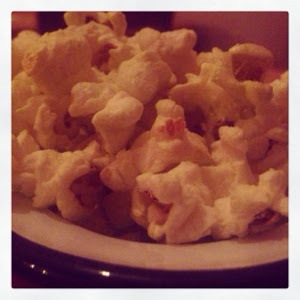 We decided to try the popcorn from the bar snacks section of the menu to start. Priced at £2.75 there was an ample amount for two people - there was a sweet variety and a wasabi variety. Both types left us wanting more and were a great accompaniment to our wine that was going down nicely. We both decided to try 'The Fat Hippo' burger which is made up of - 2 beef patties, homemade (and huge) onion rings, chirizo, bacon, cheese and fat hippo sauce all in a brioche burger bun with a side of homemade chips and salad. How anyone could get their chops around these bad boys is beyond me! Good job they are served with a knife and fork! They took a bit of deconstructing to eat. 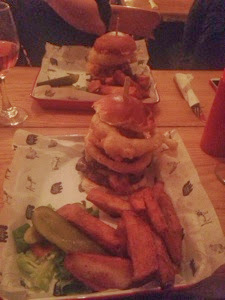 Look at the height on our burgers! Huge! I like how we are told they are served pink and juicy (as they should be) and asked if this is ok. It certainly was with me! Now although I love my friend, sometimes I think she is a bit weird when it comes to food. She asked for her burger to be served well done and this was absolutely not a problem. We enjoyed the music, wine, company and digging into our buger. We were sooooooo full when we'd finished but both agreed it was one of the best we'd ever had and it was very very satisfying. A burger plus handcut chips and a salad will set you back between £8-£9.50. The prices are a steal during happy hour (Mon-Fri 5-6pm) where you can enjoy 3 courses for only £11.50! 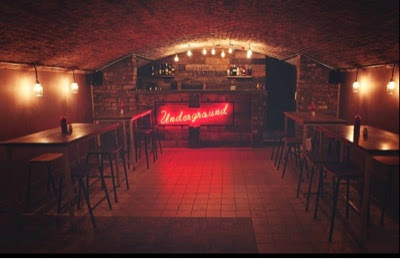 The Fat Hippo Underground opens tomorrow! 12noon-late weekdays and 11am-late weekends. Call 0191 4471161 for reservations.